Google Instant Search is a very interesting experiment that could change the way you find information on the Web, but the new interface comes with a lot of unpleasant side effects. 1. Google Suggest can no longer be disabled. Even if you disable Google Instant, suggestions will still be displayed. 2. You can no longer change the number of results. The interface would be less fluid if Google had to fetch 50 or 100 results every time you change your query. 3. Google Suggest no longer shows previously typed searches from Google Web History. This was a great feature for repeated queries. Marissa Mayer said last year that "40% of searches on any given day are repeat searches for a user". 4. Google Suggest no longer shows 10 suggestions. Because of space constraints, Google only displays 4 suggestions, followed by your original query. 5. The fade-in animation has been removed. This feature used to hide the navigation bar and all the links from the homepage until you moved your mouse. 6. "Search within results" is no longer available. This feature has never been useful because it didn't actually search within results. It only allowed you to add new keywords to an existing query. 7. Google's search box is not displayed at the bottom of the page. As Amit Agarwal points out, you have to scroll to the top of the page to change the query. 8. No more Wonder Wheel. Google's visualization tool allowed you to explore related searches. 9. Google removed the virtual keyboard. This feature is no longer available at Google Russia and will probably removed from all localized interfaces in the future. "Our virtual keyboard allows you to enter the precise search terms you want, regardless of the language keys on your physical keyboard. It can be helpful for people who use one of the many non-Latin script-based languages that require special characters," explains Google. All of these features are still available if you log out or you use Google SSL, the encrypted search interface. Can you find other missing features? I have a feeling that point number 3 will return in time. The I'm feeling lucky button now points to 'google.com/logos/' on the homepage. You can't use experimental search features with instant search. Google instant is not accessible in firefox 3.6.9. why so? on the right of th search box there is a drop down menu with an option to return to the "clasic" search. Only the features #2, #4, #6 and #7 are available if you turn off instant search. OptimizeGoogle seems to break instant search. I'm pleased to see the back of the fade in, but why retain it if you switch 'instant' off? That's just inconsistent. I like using Chrome for repeated searches to work-around #3 above. if you search but don't click on anything, your search isn't saved in your Google Web History, which I think is totally weird. The old "on enter" model would save searches regardless. It's saved, but only after 3 seconds. I use Google Advanced Search as homepage. I am grateful you have not tampered with it. Please do not tamper with it again. You did once and it was not an improvement. You got rid of filetype boxes and I now have to type the "filetype:pdf" command when needed instead of checking a box. Progress? In the eye of the beholder. Google Scholar Advanced Search and Google Books Advanced Search are excellent, useful interfaces as they are. Hint, hint. I like the Search Cloudlet Firefox add-in for shaping searches that are not helpful from the initial return list. Is there any chance such functionality might be added to all Google search pages --- as an optional on/off thing? I noticed yesterday that the fade-in effect was gone. I got to say though that I don't miss any of those now removed features. I did noticed that there's a Page Preview under More search options, but I don't know if that was there before. Thank you for the detail and thoroughness. > All these features are still available if you log out or you use Google SSL, the encrypted search interface. This is quite valuable. You have go back into Settings/Search Settings, but you get your history back instead of suggestions. Bravo to you for the discovery. Now let's see if Google has become so Microsoftian numbnutted that they close the treasure hole. Formerly, Google (and its family) always stood for common sense and intelligence while Microsoft has always been the world leader in clueless incompetence in interface choices. Now, I'm worried. If Google closes the hole, that will speak volumes as to their self-bestowed demise. Point number 3 is the only one I care about. I hope it comes back in time. Wonder wheel is gone with the wind. Turn off Google Instant, then use http://www.google.com/webhp?complete=0&hl=en. #2: I always set 50 results because it's far more efficient to load one page than five, and I could scroll up and down through related results easily. Limiting it to 10 is plain idiotic, and leaving the option to change it in search settings is bogus. Likewise on the other issues. Bleech. This is not improvement. I must admit that I do miss having the search box at the bottom of the page, I've found myself having to scroll back up several times to re-search. Argh... I wish it showed previous searches. Then turn it off in the preferences page. 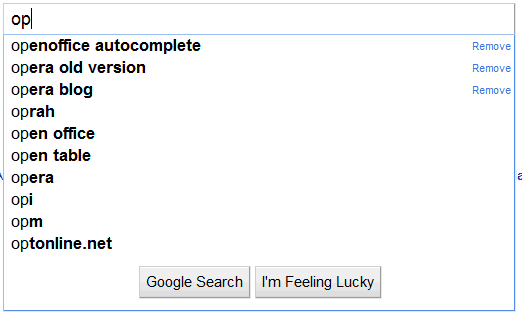 If you disable Google Instant in the preferences page, you can change the number of results to 100. Thanks for the comment by anonymous, who uses Google Advanced for a homepage. I'm an advanced searcher who found Instant a real pain. Taking the time to either sign in or turn Instant off was time-consuming. I never thought of setting Advanced as the URL for my bookmark toolbar. It's a great idea! Really! the instant search option is of no use, but pretty disturbing and hate it when I am typing and it starts showing me the results. That thing really messed up. Does anyone know of a style or script that will restore the second search term box?